Edinburgh Monarchs eased into the Championship KO Cup semi-finals after putting the brakes on Berwick Bandits in their quarter-final second leg tie at Shielfield Park. Despite going down narrowly 48-42, Monarchs’ commanding 24-point home-leg lead saw them sail through 99-81 on aggregate. They will now face Workington Comets or Newcastle Diamonds in the last four. The only Monarch who was not at the races was American Max Ruml, who failed to score from his four rides. Monarchs skipper Erik Riss top scored with 13 points and looked good for a 15-point maxmium. However, a third-place finish behind Bandits pair Kevin Doolan and Aaron Summers in heat six ruined his hopes. Team-mate Ricky Wells weighed in with 11 points and also harboured hopes of a five-ride full house but, after winning his first three rides, Wells suffered a retiral in his fourth outing. Monarchs were actually in with a chance of winning the meeting and led the Bandits by six points after only five races. New signing Victor Palovaara combined with Wells to score a brace of 5-1s early on. 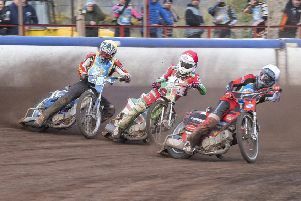 However, Berwick produced a quartet of maximum heat advantages themselves which set them on the road to victory without ever threatening to demolish Monarchs’ huge first-leg Armadale advantage. But Monarchs put a coat of gloss on their performance in the heat-15 top scorers race when Erik Riss and Wells claimed Monarchs’ third 5-1 of the match against Berwick’s David Howe and Doolan. Monarchs’ Mark Riss tumbled off in heats seven and ten and the German was replaced by Ruml in the penultimate heat. And there is no doubt that the elder of the Riss brothers is proving something of an enigma this year. Josh Pickering was last in his first ride but won his next two and there are signs that the Australian is rediscovering the form that made him such a favourite in his debut season with Monarchs in 2017.